You rocked the vote… now it’s time to rock the dance floor! Join us as we celebrate all that makes North Carolina great at the 2017 Rock the Ball concert featuring Chapel Hill-based Mipso. Tickets are selling fast for this indie-folk favorite. Tickets are $35 in advance with proceeds benefiting the Junior League of Raleigh’s community programs. Purchase your Rock the Ball ticket here. Renegade traditionalists Jacob Sharp (mandolin), Joseph Terrell (guitar), Libby Rodenbough (fiddle) and Wood Robinson (double bass) deliver powerfully rhythmic, lyrically sharp and beautiful four-part harmonies as Mipso. The North Carolina-based indie-folk band, influenced by the progressive vibes of Chapel Hill and its surrounding rural landscapes, mixes the complexities of traditional bluegrass with modern instrumentation and smart pop melodies. The result is the intoxicating blend of Americana filling their sophomore album Old Time Reverie. 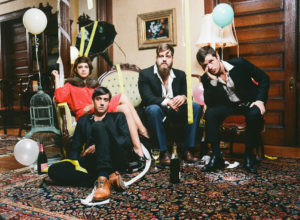 The 2015 album was named among the “Best Records of the Year” by The Guardian, for the band’s “aptitude for stunning harmonies” and “lush and moving songs that feel as fresh as a warm spring rain.” Old Time Reverie sees the quartet expanding its sonic resources while doubling down on experimentation with string band tradition in a gripping, mature reflection of musical and personal growth.